Sean Spicer was repentant as he reflected Wednesday on his gaffe comparing Adolf Hitler to the present-day leader of Syria, whom he erroneously accused of being more cavalier with chemical weapons than the Nazi leader. At Tuesday's press briefing, the White House press secretary's remarks ignored the chemical weapons used in Holocaust. A day later, Spicer called the mistake "inexcusable and reprehensible" in a conversation with NBC's Greta Van Susteren at an event at the Newseum in Washington, D.C. He hasn't spoken to President Donald Trump since the briefing, he explained, but he said, "I've let the president down," and called it a bad day both personally and professionally. His remark that Hitler "didn't even sink to using chemical weapons" quickly drew rebukes from Jewish groups and critics, and he apologized — though in his initial attempts to explain he compounded the error with inartful phrasing and continued contrasting of Syria's alleged chemical weapons use with Hitler's actions. 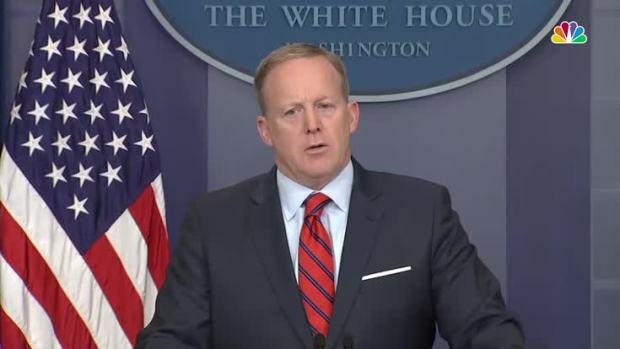 White House press secretary Sean Spicer sparked backlash Tuesday when he favorably compared Adolf Hitler to Syrian President Bashar Assad, saying Hitler did not "sink to the level of using chemical weapons" during World War II. Spicer's comments came on the first day of Passover. House Minority Leader Nancy Pelosi was among those calling for Spicer to be fired. Among the lessons Spicer said he learned was "I should not have tried to make a comparison. There's no comparing atrocities." That was the takeaway for Spicer's German counterpart as well. Angela Merkel spokesman Steffen Seibert said Wednesday that Spicer's comment "only shows what is in any case the German government's position — any comparison of current situations with Nazi crimes leads to nothing good."